LG Electronics (LG), a leader in Bluetooth headset technology, will unveil a number of new wireless, wearable audio products at CES® 2017. The line-up will be led by TONE Studio wearable speakers capable of delivering amazing 3D surround sound and TONE Free earphones with wireless earbuds that charge when docked in the companion neckband. The LG TONE Studio (model HBS-W120) personal wearable speaker features four speakers – two full range on the top and two vibrating on the bottom – that give a personal surround sound experience when watching a movie, playing a video game or simply streaming music. Its sound is designed in collaboration with surround sound experts at DTS to bring a realistic theatre-like sound for a cinematic experience wherever you may be. The TONE Studio features a Hi-Fi DAC (Digital to Analog Converter) that enhances sound quality by recreating audio content as accurately as possible. What’s more is that with Dual Play, you can connect two LG TONE Studio wearable speakers and share the sound from a movie, playlist or more. TONE Free (model HBS-F110) is LG’s first wireless stereo product to come with wireless earbuds that charge whenever they are stored inside the neckband, making them easy to charge and carry. 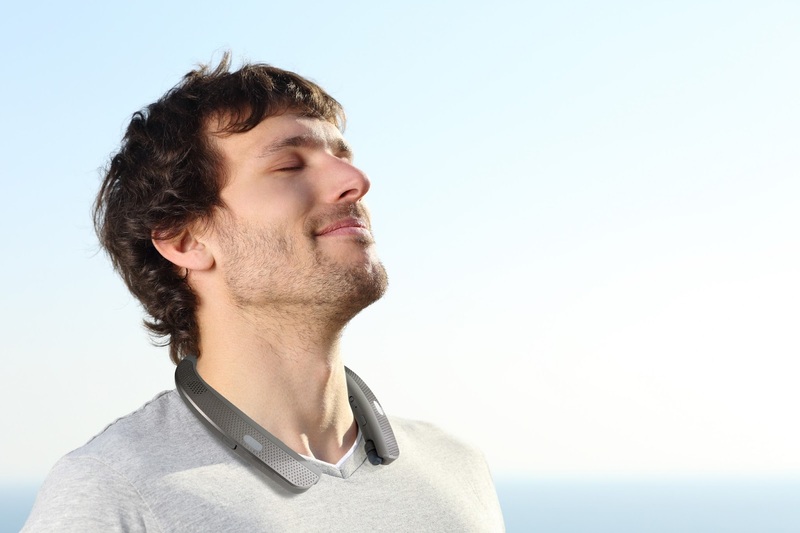 Not only does the neckband provide extra battery power and vibration alerts for incoming calls and text messages, it also provides a secure place to store the earbuds when not in your ears, making them less likely to lose. An optional charging cradle provides more power for those times when the neckband might not be convenient. And for even more freedom, TONE Free lets you go completely hands free and answer or ignore a call with voice commands for a real wireless stereo experience with no cords, no tangles and no hassles. The TONE Studio and TONE Free are just two of the marquee products in LG’s Bluetooth headset line up at CES 2017. Other models to be unveiled include TONE Infinim (model HBS-920) featuring LG’s Metal Layer Speaker Technology for clean, crisp sounds and TONE Ultra (model HBS-820), developed in collaboration with audio specialist JBL that features dual MEMS microphones for remarkable call clarity. LG’s entire line up of wearable audio products including TONE Platinum, TONE Active+, TONE Pro and LG FORCE will be on display at CES 2017 from Jan. 5-8 in Booth #11100 in Central Hall of the Las Vegas Convention Centre. I really love these earphones and looking forward to have them once they reach South African shores.